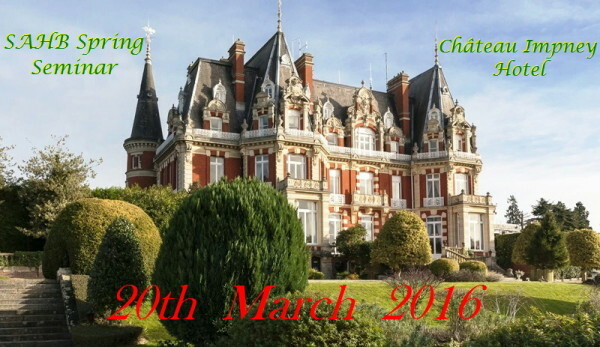 The SAHB Spring Seminar will be held this year at Château Impney in Droitwich. This is a new venue to us, but Château Impney has a strong motoring connection, with sprints and hill climbs held here from 1957 to 1968, and revived in 2015. We hope members and their guests will enjoy the advantage of having the seminar, overnight accommodation, and Saturday dinner in the same venue. Anders Clausager has already emailed the booking form and details to SAHB members (see his email dated 29th January). Please book whichever elements you need (accommodation; dinner; seminar) as soon as possible. If you need any further information or help, just contact Peter Moss on peter.moss12@btinternet.com or on 07887 887197.